Two indicators were selected to measure transnational economic integration and competiveness in the metropolitan regions in the VASAB LTP background document: “Metropolitan regions accommodating international public/political organizations and firms” and “Metropolitan regions of the BSR as hosts of non-domestic but still BSR-based financial services (banks).” Although these are interesting indicators they are difficult to collect and update, especially for Russia and Belarus. Therefore, the competitiveness and innovation of cities in the BSR is focused on “education” and the “knowledge based economy”. The level of education in cities is generally higher than in the rural and peripheral areas. People with higher education often tend to move to urban centres, which provide more job opportunities and ‘act as magnets for talents’. The concentration of highly educated people plays a crucial role in development of cities for a knowledge society, and consequently exploiting the associated economic potential (State of European Cities Report 2007). In 2012 there is still rather large east-west disparities in the level of tertiary education in the BSR and the urban areas are no exception to this pattern. 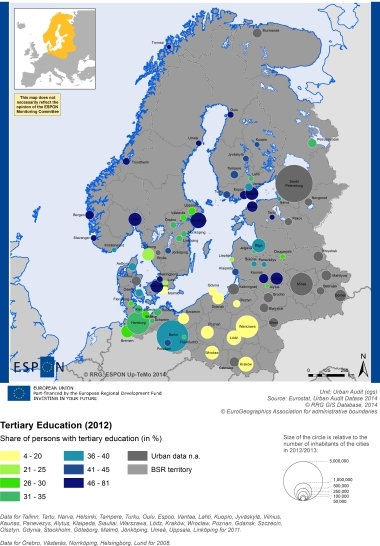 Most of the cities in Poland have less than 20% of people with tertiary education, ,while in many larger cities like Vilnius, Tallinn, Copenhagen, Helsinki, Oslo and Stockholm half or more the city residents (46-85%) have tertiary education. In general national variations among cities can also be observed (as in Sweden, Denmark, Latvia, Lithuania and Germany) but Finland is somewhat of an exception to this with levels throughout the country. In Finland and Norway many cities place themselves in the highest category indicating a high level of education across different sizes of urban areas. In Germany there is a clustering of higher levels of education in the south-east cities, while the north-west cities show lower levels (however this might be due to a threshold effect). The BSR large cities play a key role when it comes to the innovation performance (VASAB LTP). As stated in the State of European Cities report 2007 ‘innovation is the first driver for urban competitiveness, is of general importance to all cities’. Overall, the metropolitan areas located in the western part of the BSR have a better position when it comes to the innovation performance as compared with these in the eastern part. In the eastern states the research and development activities performed more by universities than the private companies, there are generally less employees in knowledge-intensive branches and there are a lower number of registered patents (VASAB LTP).